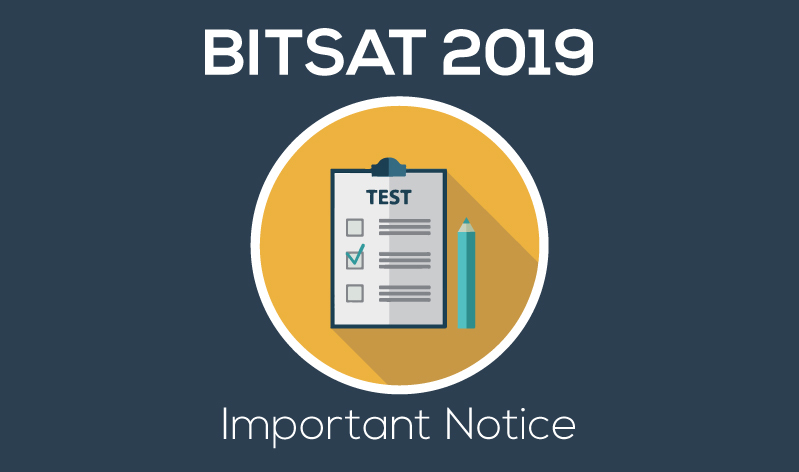 Due to an increase in the number of requests from students and parents the Birla Institute of Technology & Science (Pilani) has extended the last date to apply for the BITSAT 2019 examination. Previously the last day to apply for BITSAT 2019 was 20th of March 2019. The new last date to register for BITSAT 2019 is March 31, 2019 (5.00 PM). Due to the extension of the last date to apply, the institute has also rescheduled the slot booking process. Earlier, the slot book process was scheduled to begin on the 28th of March 2019. Candidates will be able to begin slot booking on 5th of April 2019, 10.00 AM onwards. The Birla Institute of Technology & Science (Pilani) will also begin allotting test centres from today (27th March 2019). The information brochure of BITSAT 2019 states that candidates will be notified of the allotted test centres today. Candidates will be allotted test centres based on their preferences at the time of registrations for BITSAT 2019. Clicking on the relevant link (to be published shortly). Test centres can be viewed by login with the BITSAT Application number and Date of Birth. The slot booking process for BITSAT 2019 begins on the 5th of April 2019. Candidates will be able to book a test date and time on a first come first serve basis. If a candidate has not opted for slot booking, then he/she will be allotted date and time of the exam as per the discretion of BITS Pilani. Post the successful completion of the registration process, the candidates will be able to download the BITSAT Admit card from 12th of April onwards. Test centres, time and exam date will be mentioned in the BITSAT Admit card. The last date to download the BITSAT Admit card is May 13, 2019. No request by candidates for a change in the exam centre, date & time of the examination will be entertained by the organizing institute. BITSAT 2019 will be conducted between 16th to 26th of May 2019. The computer-based test is an all-India entrance exam conducted for admission into the 4 Birla Institute of Technology and Science (BITS) campuses, namely, BITS Pilani, KK Birla Goa, Hyderabad and Dubai. BITSAT exam and application dates are out: Apply now! Are BITSAT Previous Year Papers Important?